Want to spruce up your PowerPoint Presentation by including videos. The condition is that you have a MP4 video on your computer, you wish to embed it into your PowerPoint Presentation but just receiver an error message. The following article will show you how to successfully insert any MP4 video into PowerPoint Presentation with ease. Video: In PowerPoint 2013 and later, for the best video playback experience, we recommend that you use .mp4 files encoded with H.264 video (a.k.a. MPEG-4 AVC) and AAC audio. In PowerPoint 2010, we recommend that you use .wmv files. Audio: We recommend using .m4a files encoded with AAC audio. In PowerPoint 2010, we recommend that you use .wav or .wma files. From above table, we can see that to add MP4 to PowerPoint 2016/2013, the MP4 files should be encoded with H.264 video codec and AAC audio codec. While to insert MP4 to PowerPoint 2010/2007, you should convert MP4 to WMV format with .wav or .wma audio codec. If you wish to find one stop solution to fix all PowerPoint MP4 inserting issue, you can download Pavtube Video Converter, which has full support for all 4K/2K/HD/SD MP4 files encoded with various different compression codec such as H.264, H.265/HEVC, MPEG-1, MPEG-2, MPEG-4, WMV/VC-1, MVC, etc. The program supports batch conversion mode, so that you can load multiple MP4 files into the application for conversion at one time. With the program, you can not only convert unsupported MP4 to PowerPoint 2016/2010 most favorable H.264 MP4 files with AAC audio codec, but also transcode MP4 to PowerPoint 2010/2007 supported WMV files with .wav or .wma audio codec. 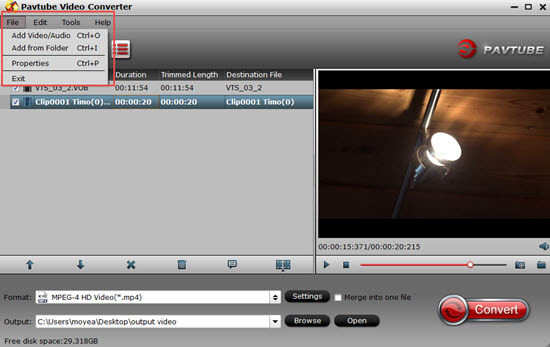 Apart from convert MP4 to PowerPoint, you can also use the program to complete some simple video editing work. If your video is too long, you can use the trim function to cut off unwanted parts from the video to shorten the video length, if there are black bars around your video frame, you can use the crop function to remove that off, you can also protect your video by adding transparent text watermark or apply other special rendering effects as you like. For Mac users, please switch to download Pavtube Video Converter for Mac to perform the conversion on macOS High Sierra, macOS Sierra, Mac OS X El Capitan, Mac OS X Yosemite, Mac OS X Mavericks, etc. Step 1: Load unsupported MP4 files into the program. Click “Add Video” bar to import PowerPoint unsupported MP4 video into the program. 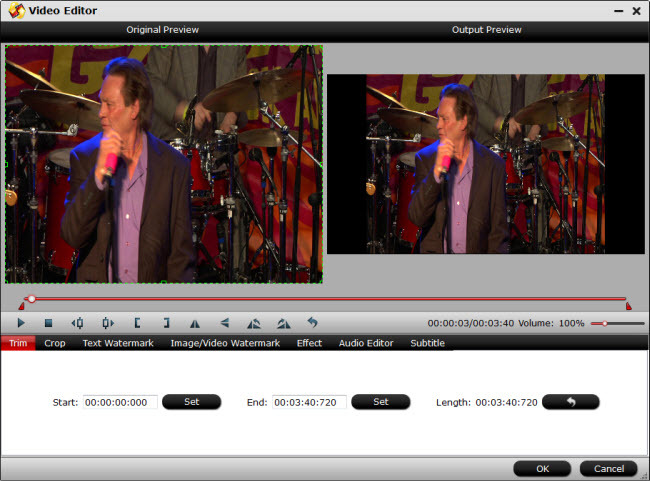 You can batch load multiple video with different file formats into the program. Click “Format” bar, from its drop-down options, for PowerPoint 2013 and later users, it is idea for you to choose “H.264 HD Video(*.mp4)” under “HD Video” main category, for PowerPoint 2010 users, you can directly output PowerPoint specially optimzied best supported “WMV-2 (*.wmv)” under “PowerPoint” main category. Step 3: Edit a video before inserting to PowerPoint. Select an item on the main interface to open the “Video Editor” window, here you can trim video length, crop video black bars, add transparent text watermark, apply special effect, etc. After all setting is completed, hit the “Convert” button at the right bottom of the main interface to begin the conversion process. Go back to the PowerPoint slide where you want to insert your video or audio file. On the Insert tab of the ribbon, on the Media panel, choose the arrow under Videoor Audio, and then choose the appropriate command for inserting your file.